We started the day early, hopeful for a top out of the trek we had mapped out. 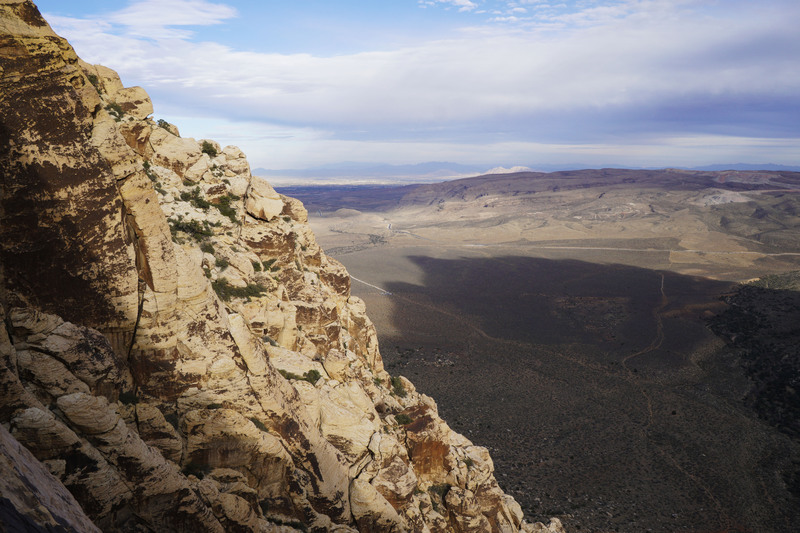 It was a climbing route Johnny Vegas with a link up to Solar Slab in Red Rocks National Park, Nevada. The entire push would be 13 pitches of trad…no easy undertaking. Sitting up in the back of the van, we attempted to shake off the morning chill while the alarms were blasting. We had slept just 5 hours after leaving work and driving from Phoenix to a campsite just outside of the park. Fresh as daisies! After stirring a few times, we finally got going and were one of the first ones in the park at 6 am. Unfortunately we hadn’t packed our gear or eaten breakfast, costing us some precious time, so we watched climbers pull in and head off to their respective routes as we labored on. Finally ready, we did a full gear check and set out on the trail. At first it was unclear which canyon we should enter. We pressed on until finally the solar slab came into view. “There it is!” announced Kari and we were soon hiking up the final approach to the base of the climb. We made the base of Johnny Vegas and noticed one group was already ascending with a 2nd group setting up for their climb. We waited patiently, prepping our gear and ourselves for the climb. 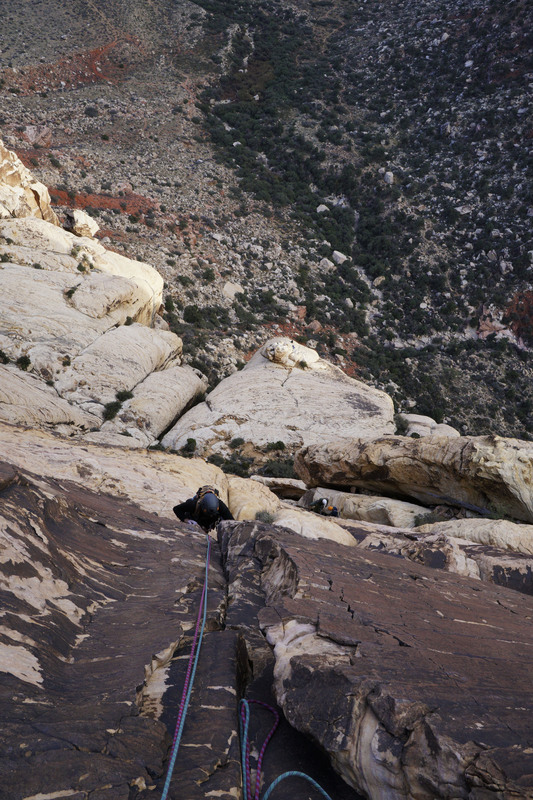 I was first up to lead and I threw the trad rack over my neck prepping to leave the safety of the first ledge. I would be sharing the next small belay with the team ahead of me so I gave them some space. Before I knew it my hands were on the wall covered in chalk. After taking a deep breath, my feet followed suit. The holds were great and finding gear placements wasn’t too bad so I sailed my way through the first pitch. I call it “turning the lizard brain on”…focusing solely on the holds and pushing any fear far away from my climbing confidence. I felt really solid and was soon clipping into the bolts at the top of the pitch trying to share a tiny ledge with Mike and Elaine, the Canadian climbers from the group ascending ahead of us. They were very nice and patiently waited as their lead climber pushed through the 2ndpitch above. Kari and the crowd of waiting climbers that gathered below were out of sight by the time I reached the anchor. I clipped in with a 4 foot long personal anchor and stood on the ledge below as I waited for the climbers ahead of me to move forward. Once they did I set my anchor in the bolts, pulled up the remaining rope, put Kari on belay, and yelled “Climb On!” after tugging the rope 3 times. He also sailed right through the first pitch; it was a fun and easy route. 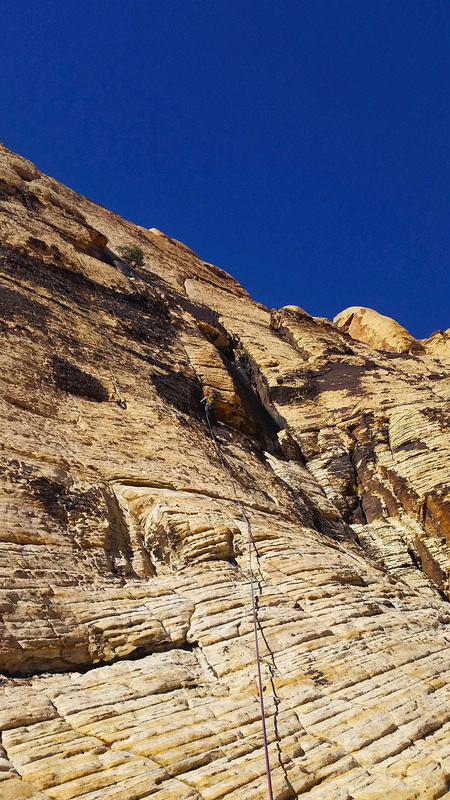 We decided to swap lead up the 2nd route so we traded gear and soon enough Kari was off, up a corner onto the white and brown stained sandstone face above. 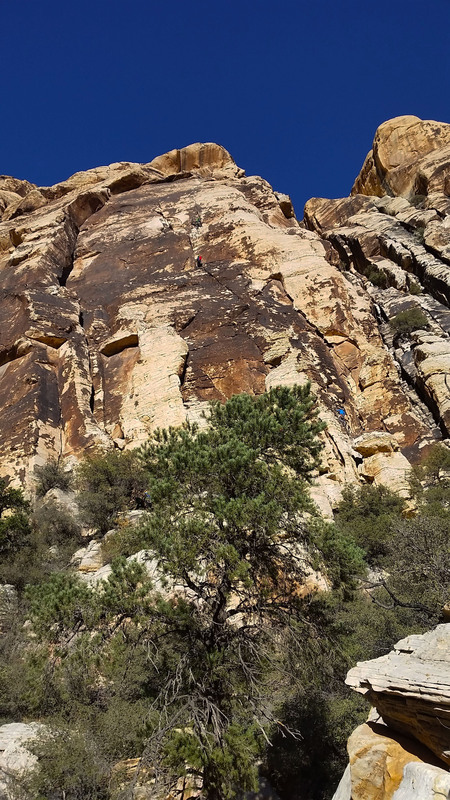 I sat below belaying as Kari climbed when all of a sudden the lead climber of the next team behind us came into view and then climbed onto the ledge next to me. We chatted for a bit talking about adventures and climbing, as well as how unique of a place Red Rocks is. In the middle of chatting I felt 3 long tugs on the rope… it was time to go! I took Kari off belay, cleaned the anchor off the bolts, gathered all my gear, chalked up, and took off. 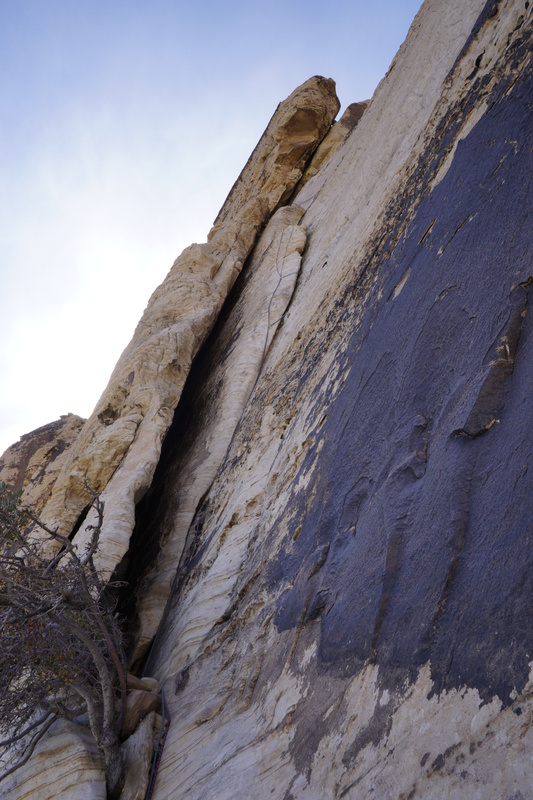 The second pitch was a little trickier than the first, but after finding some really solid holds it was another cruiser. I reached Kari belaying from a large ledge with a smile on his face. “What’s uppppp!” he said smiling, really enjoying the climb. I got to the bolts, threw my personal anchor on, as swapped all the gear over again… I was back to leading. We checked the time and realized we were running against the clock. Not only was there a team right behind us, but other teams were climbing up an easier 5.3 gully to the east that could get to the base of the Solar Slab route quicker. This would leave us once again waiting on another team and potentially killing our chances of ascending to the top of Solar Slab. Hurrying on, I led out into pitch three which turned out to be a bit different than the first two. It became more slab-like with nice features to grab and seemed to go around a corner and on beyond our sight. This section ran a good 20 foot until I could finally place my first piece. “Whew!” I thought. The climbing wasn’t hard but slab with a little exposure always makes you put yourself in check. I gained the corner and slung a small chicken head just before clipping in my rope. Safe again! The next part of the route was just as tricky as there were no good pictures in the research and it wasn’t clear from just looking at the face where to go. I pushed up and over a corner to the left face right into more slab territory. With all the zigzag gear placements and movements of the route, the rope started to have a lot of friction and became hard to pull up as I climbed. I looked left…I looked right… no clear path. I turned my gaze upward, the only way left that made sense, and pushed on. At this point I realized I hadn’t placed a piece in a while and the resistance from the rope drag had started to affect my climbing. I became worried that I was off route, not sure if I could make it to the next set of anchors above. On and on up the whitewash sandstone slab, I finally I found placement for a cam in a small crevice. I clipped in and look around, still with no idea where the route was supposed to go. I called down to Kari to let him know what was going on but he couldn’t do anything to help me at this point. I had no choice but to keep grinding up the face and try to find a good place to belay him, knowing the other team behind us was waiting. I got to a point where I couldn’t move because of the rope drag on me, so like tug of war with a bull I pulled about 8 feet of slack up allowing me to climb up and over the face. With this much slack and the amount of rope drag, if I were to fall it wouldn’t be pretty. I pushed the issue far from my mind and topped the slab dome in front of me. BOLTS!!!!!! Boy was I happy to reach the end of that pitch. I anchored in and set up to belay Kari below. “Climb on!” I yelled after taking all the slack. The amount of friction on the rope was intense and made the belay utterly exhausting. After Kari reached the anchor, we looked back and realized that I had linked pitch 3 and 4 into one long pitch, making it much more difficult than it should have been. Nevertheless, we had ascended Johnny Vegas and it was time to push on to Solar Slab. Kari, killin it on pitch 1 of Solar Slab, Hes right at home here in Kari natural slab environment! We barely beat another team ascending the 5.3 gully below and got on Solar Slab quickly. Kari took the first pitch which started as a low angle class 4 then slabbed into a class 5 crack with some fun body movement. 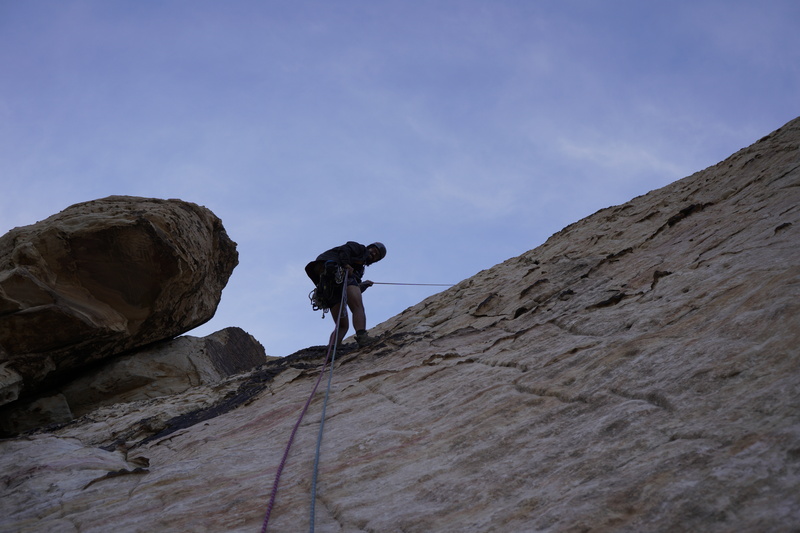 Kari always makes slab look so easy to me…he breezed through the pitch, stitching it up with trad gear easily. Soon he was at the top of the pitch, all set up to belay me. I stuffed a Cliff Bar down my gullet and put my shoes back on that I had taken off for a quick breather. It was time to climb again! This pitch was quite fun, it wasn’t straightforward and you really had to search for the right solution to ascend the climb. I gained the crack and before long was next to Kari on the ledge ready to once again lead the next pitch. Pitches 3 and 4 of Solar Slab were recommended to be linked together, I looked up the first section and the runout was quite long. Kari chimes in, “Do you want me to lead it?” “Nah, I got it”, I replied. I felt good, even with the runout and the rope drag, and my head was on straight. I roped in, geared up, and set off across the ledge to the west and up a fat attached flake system. There were small pockets, but nothing deep enough to place gear so I climbed on. Once again I found myself with about 25 foot runout from Kari but I had no choice but to climb further until I found a good spot to place a cam or nut. After about another 5 feet I found the spot, placed a piece, and clipped the rope to it. I breathed another sigh of relief but still felt really good. I climbed on, ascending the flake, and found the top of pitch 3. After clipping the rope into a draw at the bolts, I decided to push for the link up and began traversing a long ledge. Finding myself with a face climb and a crack to the left where I should ascend, I started up. It was a tough slab with small feet, but I spotted a bomber left handhold about 10 feet up. I climbed, set my left foot, and just as I reached for the hold my foot slipped off the face! Down I slid, down onto the ledge below. “Ugghhh” I sounded as I landed. “What was that? !” Kari shouted up from the belay below, out of sight. “I took a small fall” I yelled back, “But I’m safe!” I got right back on the face, making the same move, only this time I landed the bomber hold, made my way to the crack and placed a piece. I kept up the good progress, laying gear as I went. The rope drag once again became enormous to the point of hindering my climbing. 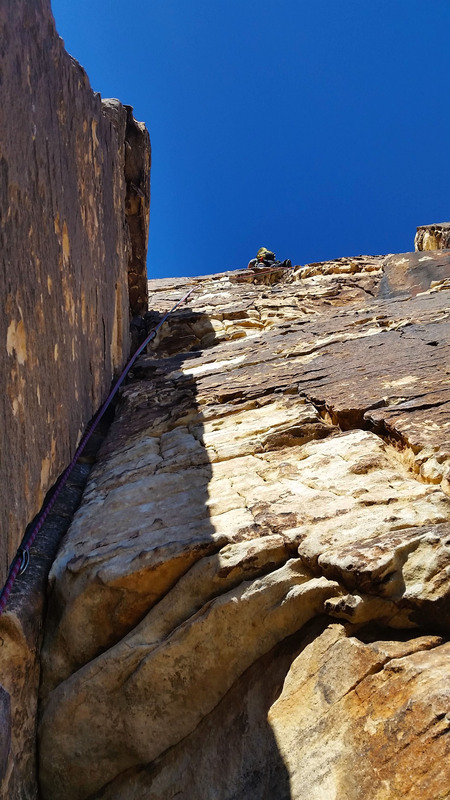 I started pulling up a few feet of slack, making a climb, placing an piece of gear, and repeating until finally I reached the top of the 3rd pitch and its anchors. Top of pitch 3 looking back down the crack. 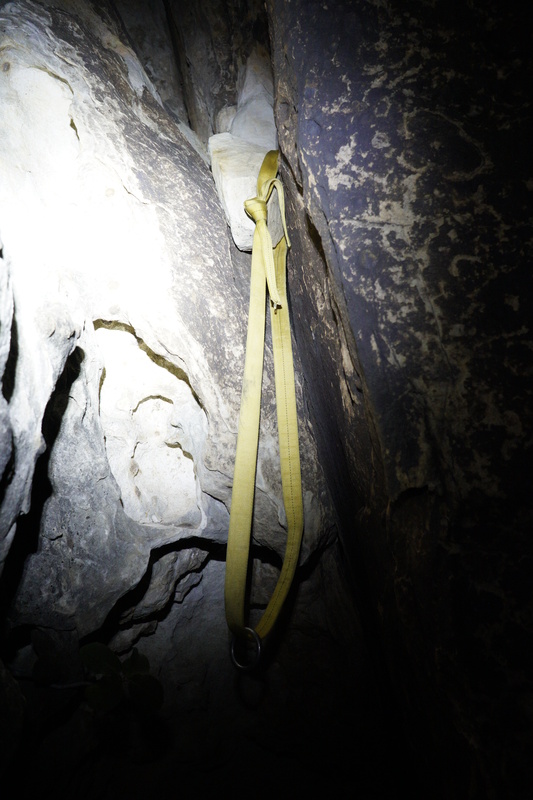 the rope drag from linking pitch 2/3 was enormous! I set up and belayed Kari, who (of course) climbed up the pitch with ease. He later told me he was glad he wasn’t the one that led the start of the runout, and that the face climb where I had so much trouble was a much harder route (I should have stuck to the corner crack the whole way up). We looked up at climbers beginning to repel the route and checked the time. We were running out of daylight with only about an hour left. Between the late start and waiting on the other climbing teams, it became apparent that the only way we were going to finish the route was in the dark. If we pushed for a top out it would be difficult to find the repel bolts in the dark, and we could put ourselves out of position to climb early the next day. “Let’s push one more pitch, then bail” I suggested. Kari agreed and began the climb of our last pitch of the day. 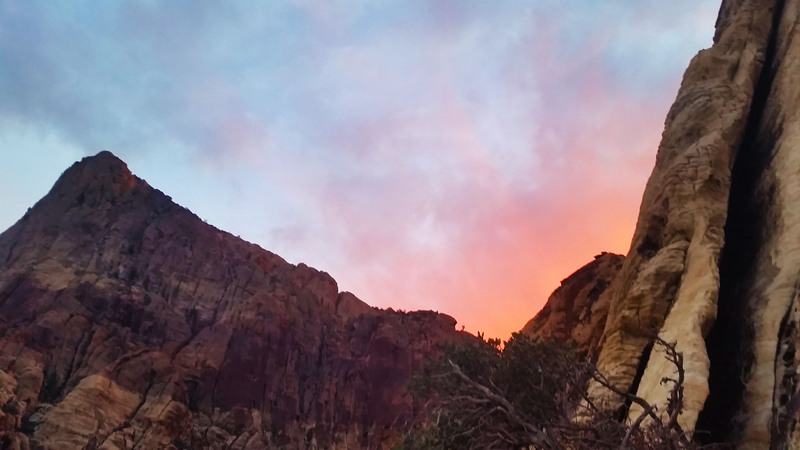 The sun dipped below the mountains to the west and I was left shivering in my shorts as Kari climbed. Kari is from Iceland and loves cool weather…I on the other hand, not so much. When it came to my turn to climb I rejoiced! After reaching the anchors, we hung there for some time, taking in the sights and snapping pictures of the route and the valley below. Man what a day! Night night sun! Sleep well! 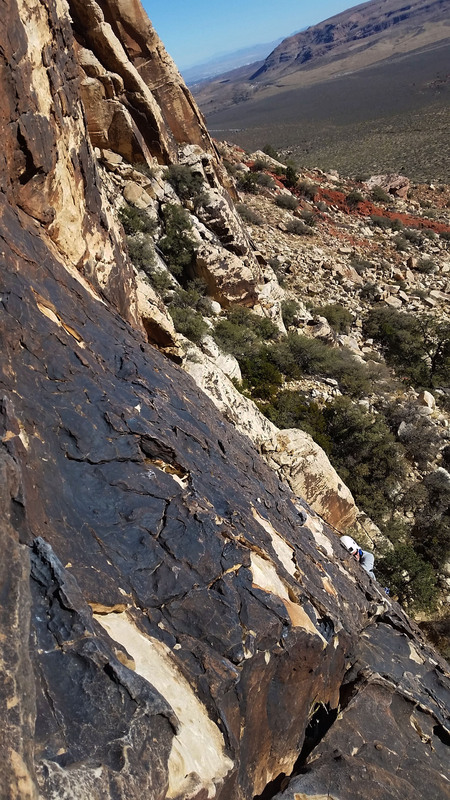 We began repelling the route, pitch after pitch until reaching the base of Solar Slab. 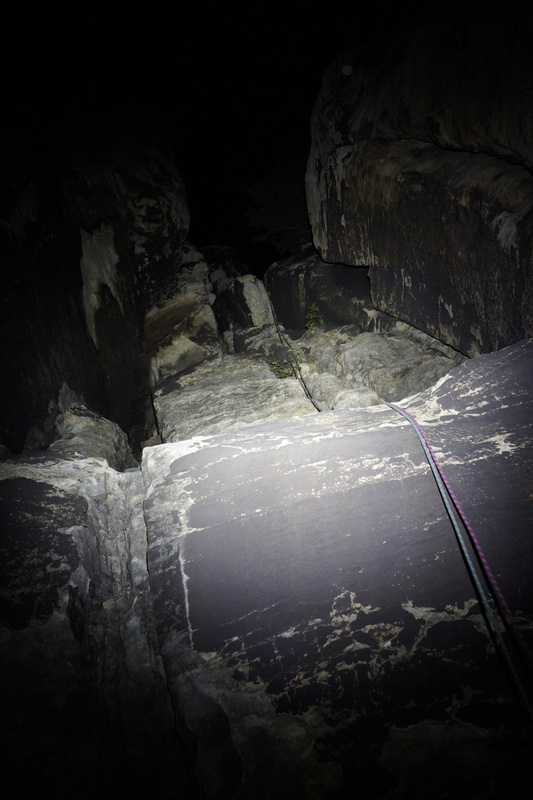 We worked our way over to the 5.3 Gulley, which was notorious for hanging up ropes, but it was easier to decend in the dark than coming directly down Johnny Vegas (which may have had other climbers on it). Kari repelled first, and then I would follow. Bolts, bolts, bol . . . . wait no bolts, what the heck! Some “questionable” webbing left behind . . . not too sure about that rock. We left our own. 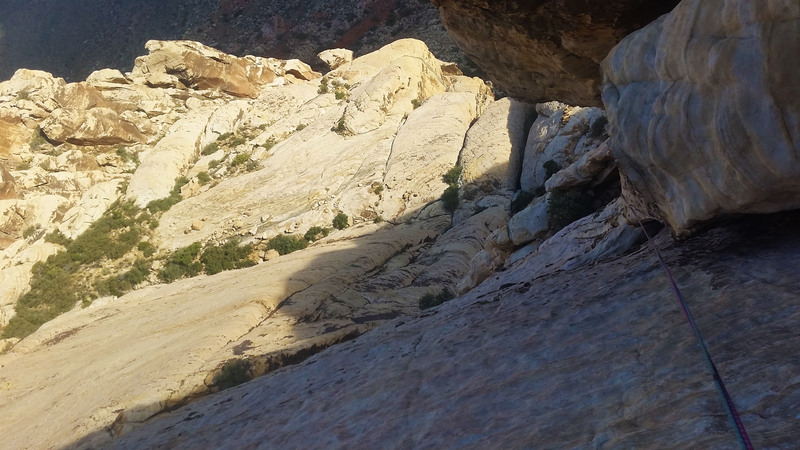 We found some old webbing slung around a nearby “questionable” rock and decided to set our own and continue the repel. At the base of each repel we would pull one half of the rope down from the anchor above which would slide freely and we could retrieve it to set up for the next repel below. After repelling from the webbing, we went to pull the rope and it started to come down. Just before the end of the rope let free, it became lodged in something above. Kari and I pulled and pulled on the rope, no luck. We pulled again, simultaneously putting our whole weight on the rope, still nothing! Without the rope we could no longer climb the next day. We tried again without success. It was either cut the rope, leave it behind, and use the remaining rope to repel or re-climb a pitch to manually free the rope so we could go home… climb it was. Kari tied in and I belayed him from below. He ascended the awkward 5.3 in the dark and soon found the rope bound up behind a boulder. He freed it and soon came repelling down, tired and exhausted ready to be back at the van. We gathered our gear and slowly hiked out through the dark climber’s path, back to the parking lot where food and rest awaited. Despite the trials and tribulations, it was an incredibly beautiful climb and great day to be outside! Still got a ways to go! Gotta love this place, best views are form the wall! Food: 2 Cliff bar, 1 apple, 1 Cliff builder bars, 2 kroger protien bars, 1 bag of Salt and Vinegar chips. 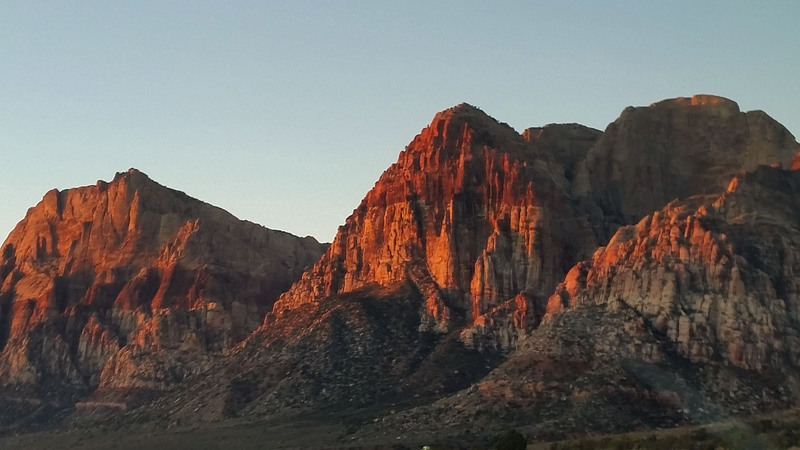 The Superstitions is such a special place. It is so rugged, raw, and the depths of which are hardly explored! My buddy Jason and I decided to do a nice day hike and hopefully see some Indian ruins in the process. 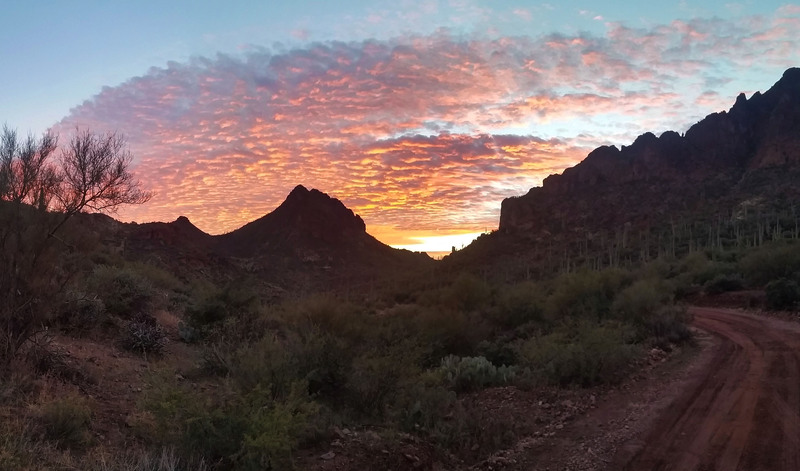 The road to Rodgers Trough trailhead is an adventure all in its own. 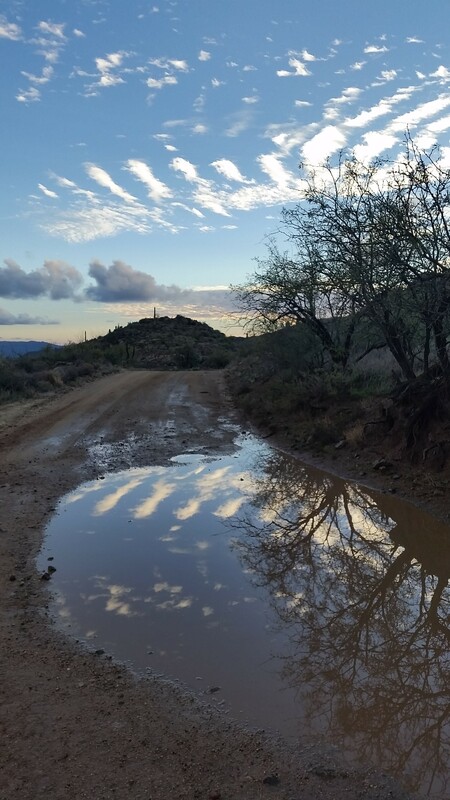 We headed out the night before in hopes to reach the trailhead, but we were thwarted by the Queen Creek running pretty deep from all the recent rain we had been getting. 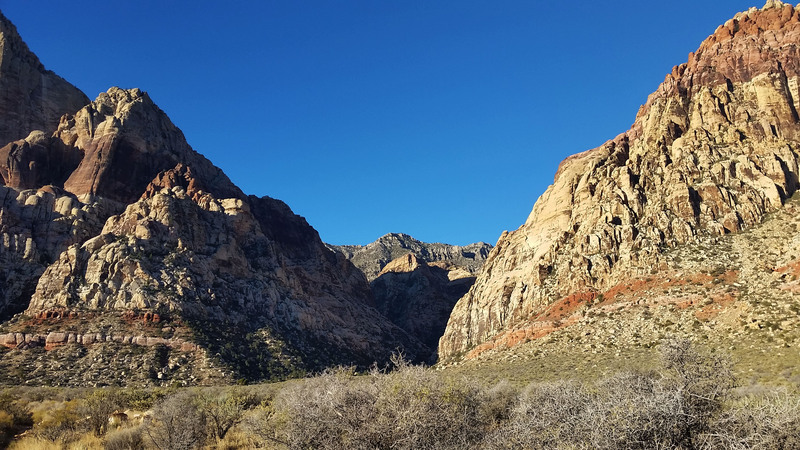 We decided to camp for the night and wake in the morning in hopes that the creek would have gone down a bit, and the dirt road (which was undoubtedly a sloppy soup) could dry out a bit. We woke early, fired up the van, and headed back to the crossing. It was much better at this point and the rest of the drive to the trailhead went smoothly (although the road is anything but). Wilderness baby! Just like home, time to get moving! 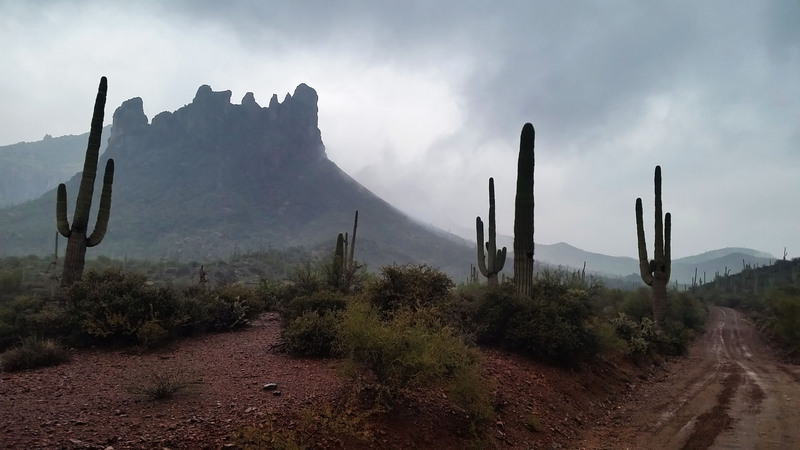 The sky threatened rain, and the clouds looked unwelcoming as we drove further into the heart of the Superstitions. 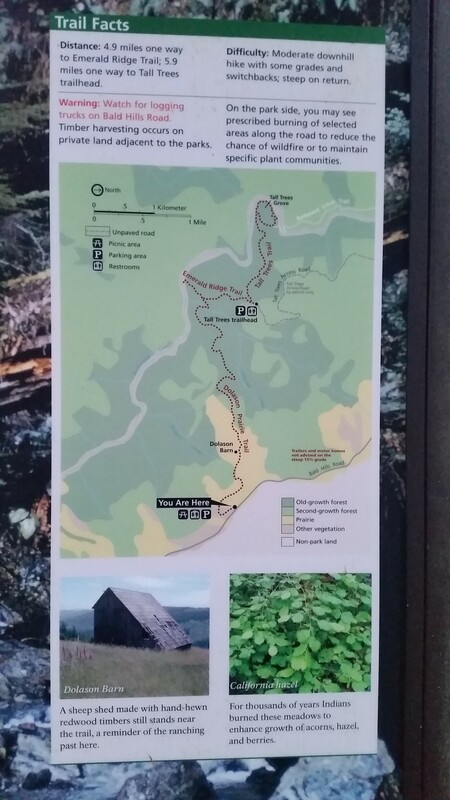 After an hour or more we finally arrived at the trailhead. W grabbed our packs and rain gear and set out on the trail. Although it was sprinkling slightly it was a pretty nice day to hike. 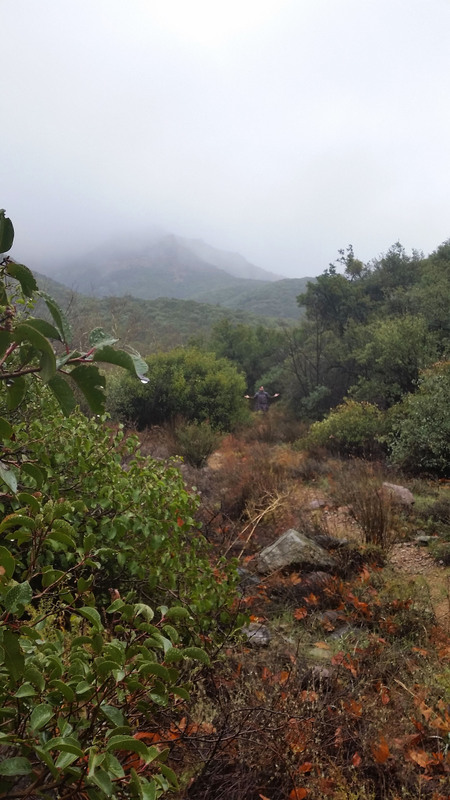 It didn’t take long before the dew covered trail side plants soaked our legs and pants. 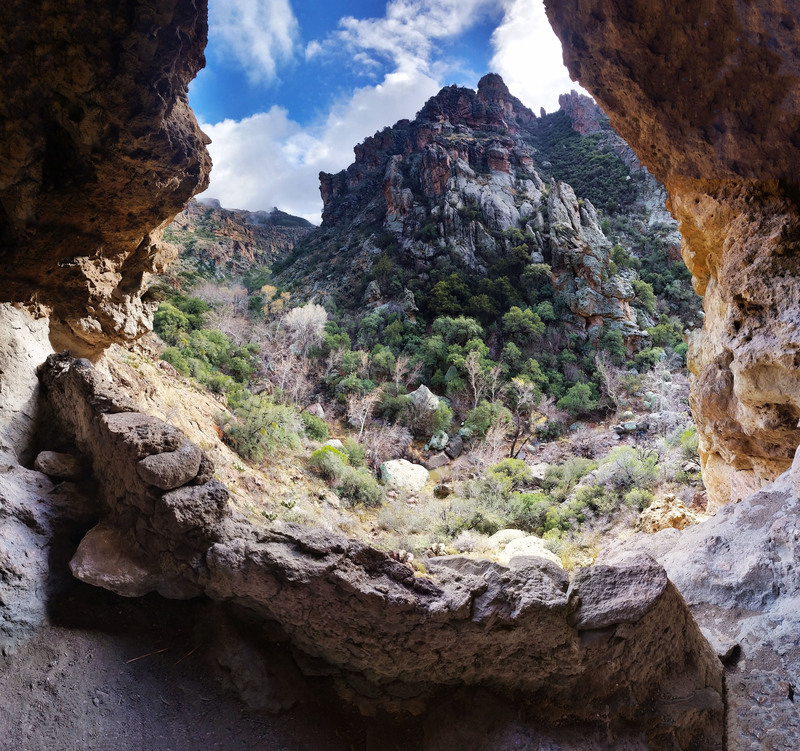 We trekked on further into the canyon until being dumped in the bottom where a small creek was running. We followed the trail, hopping back and forth until the canyon headed up and over the next hill. We made the junction for Rodger Canyon and we paused to admire the sign before headed west away from the AZT. Where are we going again?! 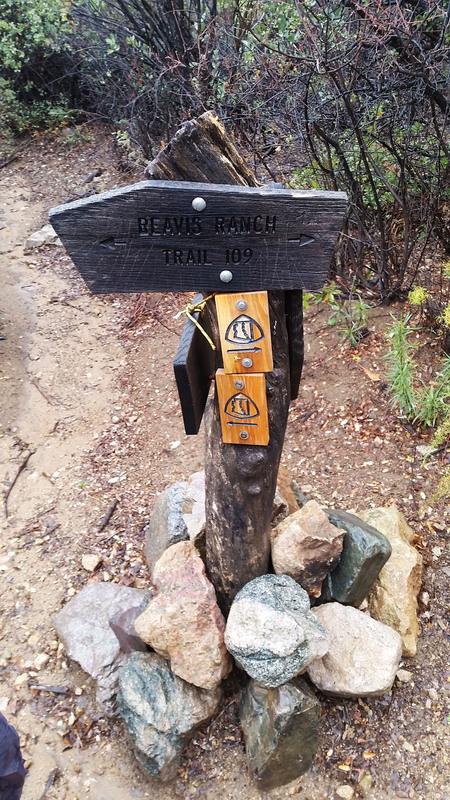 The trail was in pretty good condition despite the rain. We trekked on startling up a few deer and birds as we hiked. What a nice day, the overcast and cool temps were welcome as we pushed further. Finally after about 5 miles we reached our destination, the Salado Indian Ruins. I had been to this site before, but it was a bit of a surprise for Jason. 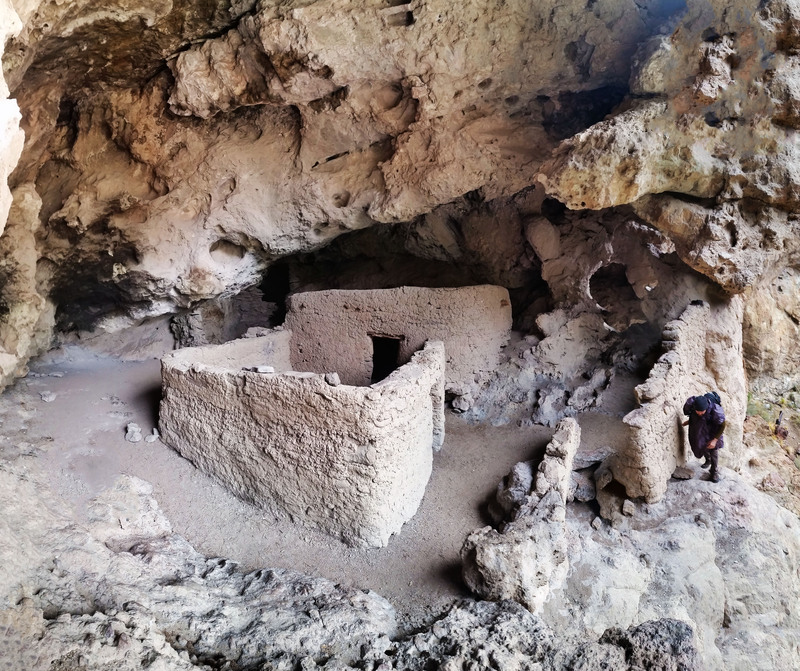 We checked out the structures that stood for 600 years in total awe. 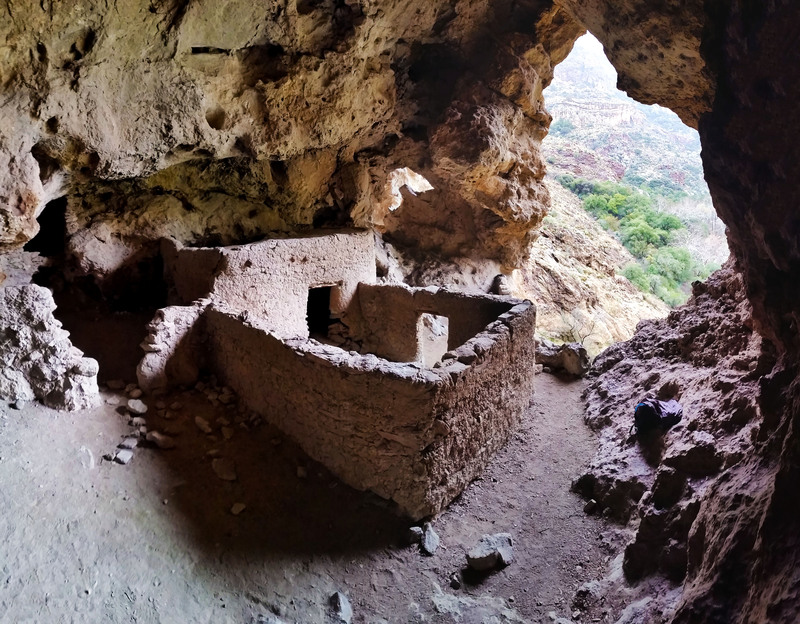 We imagined what it was like to live in that time, what it took to survive there, how many people were in that small cliff dwelling, and of course, what actually happened to them. 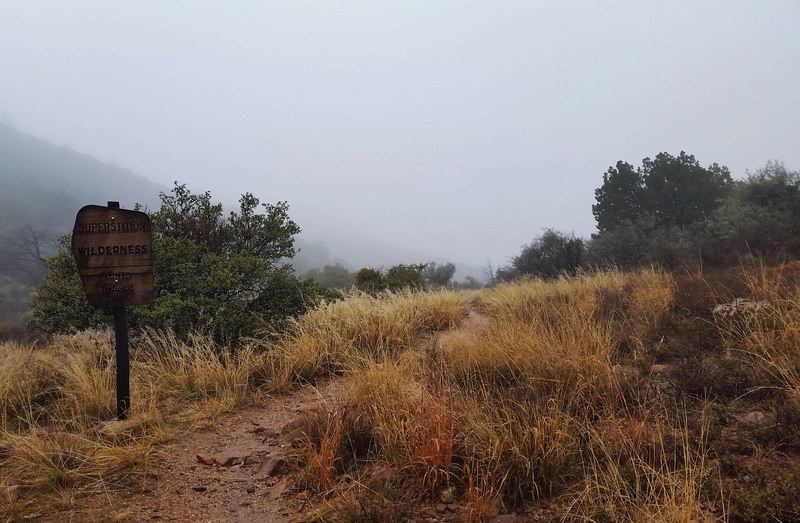 We hung out in the dwellings for some time, had a snack, enjoyed the views, and finally the fog and the gloomy clouds began to give way to bluebird skies. The structures themselves were increduble. 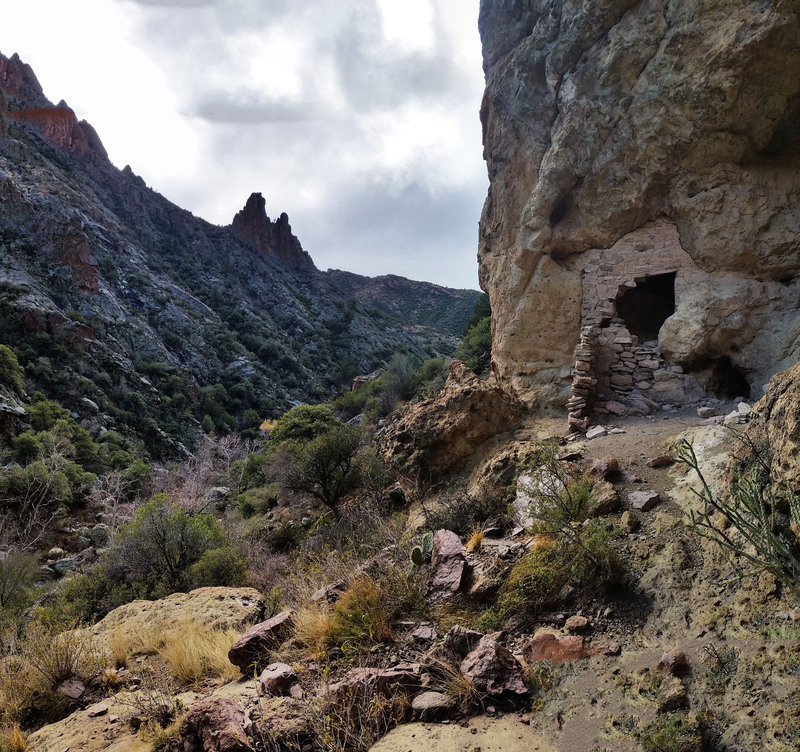 How the indians lugged that much rock, logs, and dirt up into the high cave was beyond me. I wondered how long it took them to complete just 1 room of the structure. How much food they would have had to gather just to feed the workers that labored on for days on end, perhaps months, to complete it. 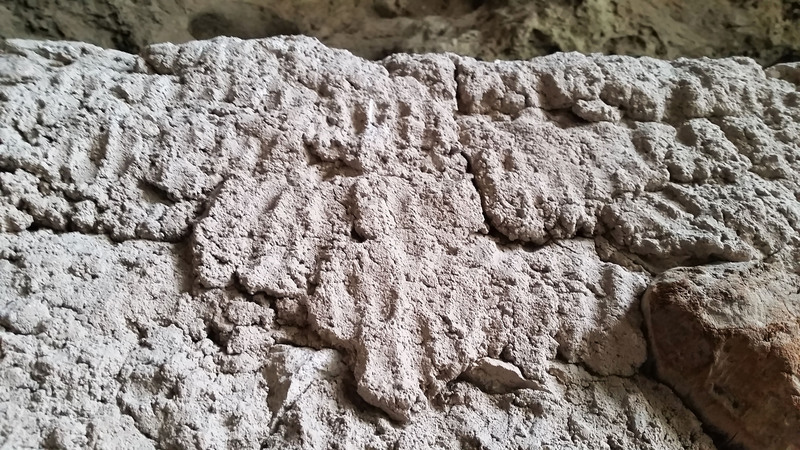 Thier fingerprints were frozen in time with the mud caked walls of the ruin. 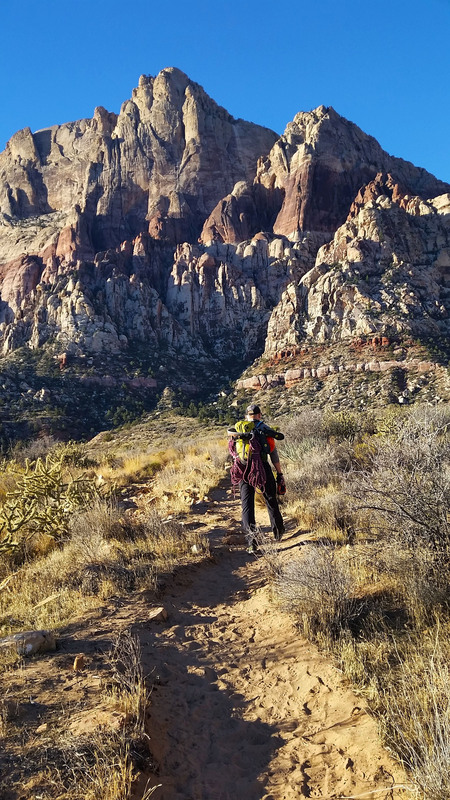 We could have stayed in the canyon forever, but we decided to get moving, back the way we came, towards the trailhead. Still holding strong 600 years later! Back to creek hopping we went following the twisting trail back and forth heading out of the canyon. We turned a corner and 30 feet from us stood a huge 8 point buck. As soon as he saw us come into view, he and the doe with him turned and like lighting bolted up the canyon walls. It is always awesome to have that chance with nature encounters in the wild. Who wants to go splashing?! 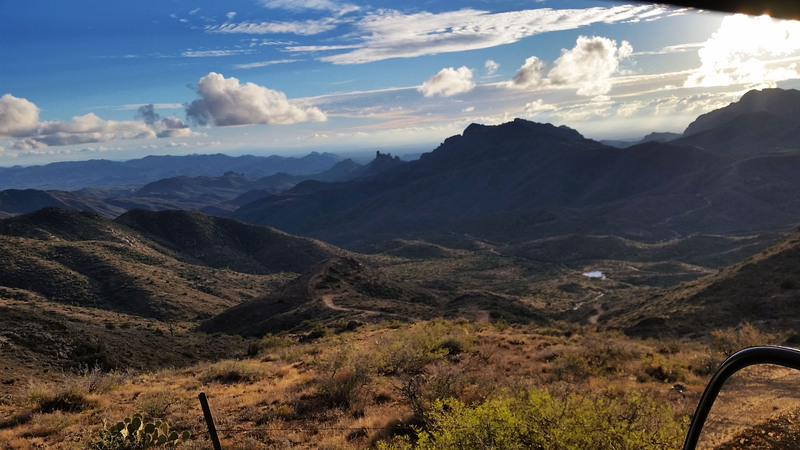 We pushed back to the trailhead, loaded back up in the van and drove back up the muddy dirt road towards phoenix. The sunset and the views on the way back were so incredible; pictures can hardly do it justice. Sometimes its hard to imagine a life without the amenities of the modern world: cars, smartphones, grocery stores. Its nice to come to places like this and be reminded to stay humble and grateful for what you have. Another awesome trek in the beautiful Superstitions was safely complete. AZ skies you are the best! same for for hundreds of years! Beautiful views on the drive out!